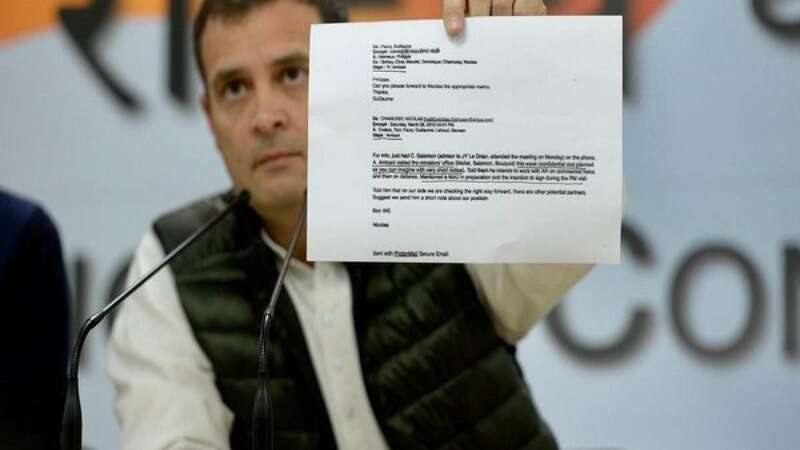 New Delhi : Rahul Gandhi on Tuesday produced fresh media reports to attack Prime Minister Narendra Modi, alleging him of acting as a middleman for industrialist Anil Ambani in the Rafale fighter jet deal with France. He also described CAG as "Chowkidar Auditor General", saying that the Supreme Court verdict, which gave a clean chit to the government, is open to question now. Addressing a press conference here, Gandhi displayed some papers and said, "An email has come to light that states 'A. Ambani visited the (French Defence) Minister's office... Mentioned MoU in preparation and intention to sign during PM visit'. How is Anil Ambani meeting the French Defence Minister prior to Prime Minister's visit?" Citing a media report, he claimed that "an Airbus executive wrote that Mr Anil Ambani met the French Defence Minister and told him 10 days prior to the deal that he is going to get it." Rahul Gandhi asked Prime Minister Narendra Modi How did Anil Ambani know about the Rafale deal advance in 10 days. "There is a breach of the Official Secrets Act (OSA). The Prime Minister had informed Anil Ambani and then Anil Ambani is telling the French (government) that he is going to get a deal that he gets. He (Ambani) opened the company after this conversation," Gandhi alleged. Anil Ambani, on the other hand, had already rejected all allegations of wrongdoing in the Rafale deal.